Thanksgiving! As American as baseball, Mother and Apple Pie. A time to go home. A time to be with family. Julie and I each have large families with whom to celebrate. The big question is always "with whom shall we eat". Often, Julie and I have spread ourselves thin going different ways for the day. Over the years we have filled our home to overflowing for a big thanksgiving spread. Some of the most special years were when we invited folks who were away from their homes and families. One year we just had "needy" folks--that may have been the most enjoyable of all. Julie is well known for the many dishes which are her speciliaties. She literally cooks all night long. I bake pies. I bake, and bake and bake pies for different families. I usually bake at least half a dozen or more just for my daughter Kimberly and her inlaws. Twice we celebrated Thanksgiving at "The Oaks", a very special place for our family. Once we went with another couple and once alone. Once we celebrated Thanksgiving at another very special place, "Prospect Hill Plantation Inn" near Charlottesville, Virginia. This has physically been a difficult year for Julie, and also for me for that matter. I felt a few days of rest would do each and both of us a lot of good. We notified all of our families in April that this year we were going to return to Prospect Hill for Thanksgiving. Although the $295 per night plus $50 per person per meal was a bit pricey on fixed retirement income, I heard somewhere that you "can't take it with you". Besides, the breakfasts were free! Ummmmm! In addition to once for Thanksgiving, we have been to this Inn a number of times. We have already done all the local "touristy" things and for this trip we decided to get three days of rest, feed the fireplace and read. We would also become acquainted with a distant cousin we discovered this year, but that is another blog. 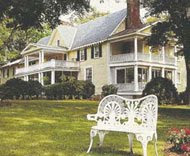 ENJOY A PICTURE VISIT OF THIS VERY OLD PLANTATION INN. The first building erected, a hand-hewn log cabin, was built in 1699. Now, folks, in America that is old. Although in size it is the smallest accomodation, this is our third time to stay here. 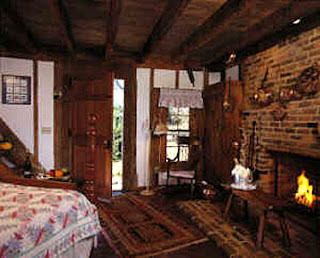 Called the Boy's Cabin, it is my faviorite, although Julie enjoyed the larger accomodations at the same price. 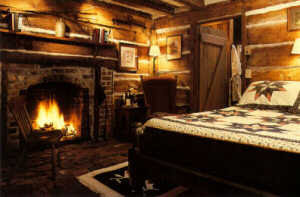 Just a good bed, a fireplace and a great jacuzzie for two. In 1732 a fine plantation home was erected. It was a working plantation with carriage houses, overseers cottage, summer kitchen and many other smaller buildings. There are 150 slave grave sites on the property. Most of these outbuildings have been made into overnight accomdations. Once we stayed in the "Summer Kitchen", pictured right. We enjoyed breakfasts brought to our cabin. We ate in our PJ's although Julie insisted upon making the bed before the breakfast was delivered. The interior of the buildings are much as they were originally. The outside of the buildings have been "sided" to protect them from the elements. Inside the main house wide floor boards and early American furnishings took one back through the years. Julie and I ate in our favorite site, a window seating, in one of three dining rooms. The celebration started with a wine reception and guests gathering to visit in several rooms. Did we eat alone? NOT AT ALL! We enjoyed the company of 48 new friends like these two from Annapolis, MD. There should be young people, right? Look at these three lovelies with their Mother. Was it a bit more formal than usual? Yes, but we clean up well. The grounds were beautiful with deer in the meadow, pictured left and a pond as pictured on the right. FOR WHAT ARE WE THANKFUL? WELL, FOR ONE THING, WE NO LONGER NEED THIS OLD TWO HOLER AFTER A BIG MEAL! YES, THANKFUL, THANKFUL, THANKFUL. BEEN THERE, DONE THAT.Hey, where's the Sear's catalog, anyway? Also, today water runs hot or cold from a facet instead of being carried in a bucket from an outside well. On the positive side, however, then one only took a bath once a week whether it was needed or not. Uh, I suspect in the southern climes it was needed. What do you think? Were those truly the "Good Old Days"? Hi Dad! Great blog post about your Thanksgiving. I especially enjoyed the reference to the "free" breakfast. Made me think of "free" health care. Ummmm... can't wait! I'll get my Thanksgiving video posted today. PS... Don't miss Bethany Pierce's blog. She's got some GREAT news!